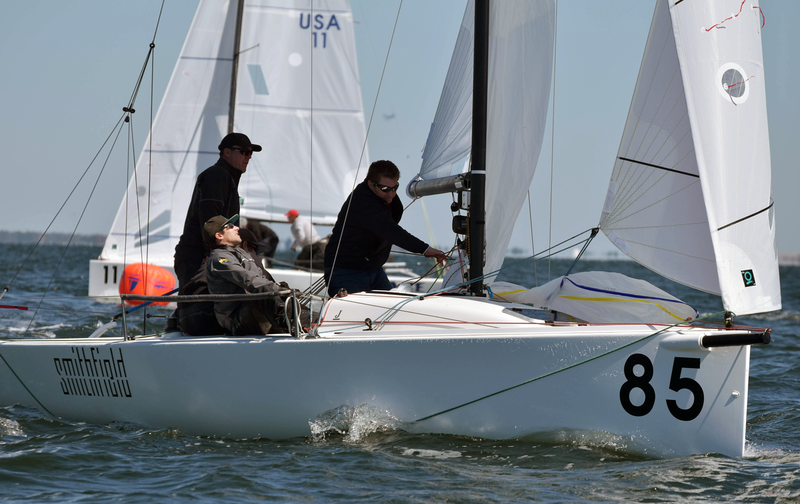 46 boats showed up for the Quantum J/70 Midwinter Championship at the St. Petersburg Yacht Club last month. Quantum sails finished 3rd, 7th, and 8th in the top ten, wining two of the eight races. Quantum’s Allan Terhune, Jr. led team Dazzler. He not only left with a third place finish, he also took home some helpful experience. Terhune shared his take-away lessons to not only remind himself of what worked, but to help other sailors taking on the J/70 class. Typically I struggle in the 10-18 knot range, which we had on the first day, but I shortened my head stay from 4’7 ¼” to 4’7” and it made a huge difference. The boat balanced and we were very high and fast. I think I might go back to 7 ¼” for wind under 10 knots, but if I were going to set an AP length, I would go with 7” from here on out. I took the back stay flicker off for this event. This took a bunch of windage off, but also the “springy” sensation on the backstay when it wasn’t fully loaded. This allowed better and uniform rig and head stay control. I really liked it (we never had a problem tacking or gybing without it either). I think a little practice and it’s a no brainer. We sailed in the breezy days with six holes showing and 1-2” of inhauling. This seemed to go pretty well. We also set the main up to be fairly flat, almost inverting the entire time. That was a good set up for the windy conditions. We made major gains when the breeze was up (above 15 knots) with blow through gybes. The crew has the system down. (I’ll write something about it later, because it was spectacular). Knowing how to wing on wing is becoming more important, and it’s definitely a weapon to have in your bag of tricks. Another big advancement for speed was using the traveler more. I had talked to Kerry Klingler about this, and he passed this information along to me. It was a big upgrade. I think this is the move to make before you get to full on vang sheeting. This worked well in 10-16 knots. Overall, the fleet is taking notice of how much effort the Quantum team puts into this event and the class. They’re also taking notice of how well our sails look and perform. The next J/70 event is Bacardi Miami Race Week. I look forward to getting out in breeze again and refining our set up even more. If you’d like more information on any of these tactics, or if you’d like to talk about upgrading your J/70 to Quantum sails, contact your local Quantum representative today! Click here for full results from the 2016 Quantum J/70 Midwinter Championship!